Everett Police released this photo last year of a person of interest in the case. Word in this afternoon that an arrest has been made by Everett Police in a murder case dating back to May of last year. Here is the press release sent out today by EPD. Detectives with the Major Crimes Unit arrested a man for the May 24, 2018 death of an Everett man. Since the death of 62 year-old Jay Agostinelli in the 1200 block of Broadway Ave on May 24, 2018, Major Crimes detectives have worked to solve the case. 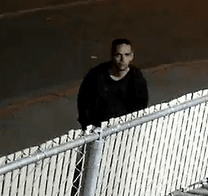 Through investigation, an image of a male near the Broadway location was obtained. As a person of interest, the public was asked to identify the male and provide tips. As detectives followed up on leads, the Marysville Police Department identified the male as 22 year-old Samuel Axlund of Bellingham. Everett detectives interviewed Axlund at the Whatcom County Jail and developed probable cause to arrest him for murder (RCW 9A.32.050). When he was released from Whatcom yesterday, Axlund was arrested and booked into the Snohomish County Jail.